They say prevention is better than cure. And the admission by the Minister of Revenue, Tialavea Dionisio Hunt, in yesterday’s edition of the Samoa Observer on the smuggling of methamphetamine or “ice” points to an issue that should quickly come under the Government’s radar before it becomes a rule of law and a health crisis. The Minister said Samoa’s borders are becoming vulnerable to drug smugglers. Recent violent incidents in Samoa have also come under closer scrutiny, with Tialavea blaming drug use for such erratic behaviour. “There have been strange and unusual incidences occurring lately and we find out late that the person was high on ice. And this is alarming and we must act collectively to eradicate this drug from within Samoa,” he said. Our neighbours have acknowledged the crisis that they have on their hands, and expressed the need for action to be taken to address it. Early last month the American Samoa governor Lolo Moliga told Radio New Zealand that the local police conducted over 25 drug raids last year. They seized drugs (including crystal methamphetamine and marijuana) totally valued at US$930,000 (WST$2.3 million). The cache included a large number of guns. 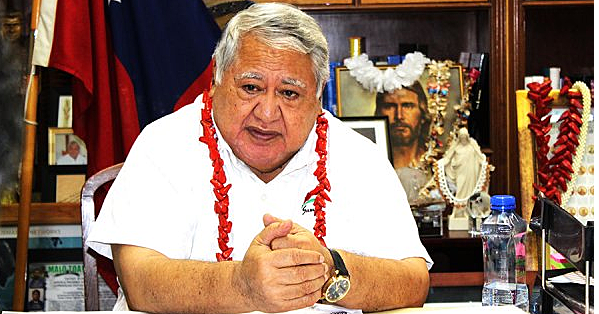 Consequently, the American Samoa governor has appealed for more effective strategies to tackle the illegal drug trade in the American territory. It is good to see the American territory going up another gear, in terms of investigations and prosecutions by the law enforcement agencies. However, Samoa is hampered by the lack of capacity and resources, as highlighted recently by the Minister. “The drug detector dogs are at the airport but not all the time as we can’t have the K9 working one shift after another, they must rest as well. “And it cost $200,000 for one K9. We station the dogs at the airports and sometimes at the wharf and hardly at the Post Office,” he said. We have every reason to be worried, following revelations by the Minister, that the relevant agencies lack capacity and resources to effectively police the border. To the southwest of Samoa is a neighbouring Pacific Islands state that is already paying a heavy price for allowing the illicit trade to continue unabated. In December last year New Zealand’s TVNZ broke the story on how a methamphetamine epidemic is “ravaging the Kingdom of Tonga and authorities are struggling to cope with the drug's destructive effects”. The TVNZ report stated that 96 arrests were made in a six-month operation by a special taskforce and up to 70 per cent of all mental health patients were addicts to the deadly drug. Tonga's Head Psychiatrist, Dr Mapa Puloka, told TVNZ that the country was hooked. "This country is hooked on drugs, there's no doubt about that," he said. The same TVNZ report said most of the drug dealers on the island were armed and are smuggling weapons into the Kingdom. There has always been a strong link between illicit drug trafficking and illicit firearms trafficking. Therefore, the destruction of close to 300 firearms in July last year by the Samoa Police Service, should be put in perspective. Where and how can such a large collection of guns go undetected when brought into Samoa? Does the presence of these weapons point to a burgeoning drug trade behind-the-scenes that is complimenting its importing? The Police destroyed the guns – some of which were collected as part of a Government-funded gun amnesty program – and expressed concern at the buildup of firearms in a state that doesn’t manufacture weapons. Consequently, it is important that the concerns expressed by Tialavea are taken on board immediately by the relevant agencies. The formation of a Government-led taskforce to begin the ground work to address the issue should be the way to go, now that the issue has been raised. Suggestions by Tialavea of home-based labs being used to manufacture the drug should not be downplayed. A technical brief produced by the Western Pacific Region Office for the World Health Organisation (WHO) states that the methamphetamine and amphetamine are now the major forms of ATS (Amphetamine-type stimulants) available worldwide. “Amphetamine may be ingested, snorted or smoked and, less commonly, injected. In powder form, methamphetamine is generally swallowed or snorted. The crystalline form of methamphetamine, which looks like glass and is often referred to as ice, is typically smoked. When smoked or injected, ice reaches the brain rapidly and is associated with a high risk of dependence reaches the brain rapidly and is associated with a high risk of dependence. There is growing evidence that smoking crystal methamphetamine has more harmful psychological effects and a higher addictive potential than other forms of methamphetamine,” states the WHO publication. Now is the time to establish a coalition of the willing in the fight against illicit drugs including methamphetamine. Enlisting the help of entertainment centers in Apia is a first step, but the first line of defence at our borders cannot be ignored, and should warrant Government investment in funding and resources to enable our law enforcement agencies to respond effectively and swiftly.